Jesus Tinoco made his full-season debut with Lansing last month, and thanks to a good-quality broadcast from host West Michigan on Sunday, May 17th, I had a chance to chart his start against the Tigers' Midwest League affiliate. As with my other "scouting" reports, I remind you that I am not an actual scout. I spent many years as a catcher/centerfielder, so I think I've always had a fairly good perspective on pitchers, but the following should not replace reports from an actual real live scout. Tinoco was born and raised in Venezuela, and was nurtured by legendary trainer Cito Barrios. His teammates at Barrios' academy included Franklin Barreto, Jesus Gonzalez, and Wuilmer Becerra, all of whom the Blue Jays signed for huge bonuses on the July 2 International signing kick-off day in 2011. Thought to be in that company, Tinoco didn't sign with Toronto until September, for a $400 000 bonus. Tinoco didn't make his pro debut until 2012, and made his stateside debut a year later in the Gulf Coast League. The West Michigan broadcasters made note of his 2-19 career Won-Loss record prior to the game, but W-L records can very misleading for pitchers in the low minors. Pitch counts, especially in short season play, are strictly adhered to, and starters often come out in the middle of innings - it's not until later that they get a chance to pitch out of trouble (as Tinoco had to in this game). So, a pitcher's record, at least until they get to full season ball, can be a reflection of the pitchers who come in after them during a game. I don't know for certain how often this was the case for Tinoco at Bluefield of the Appalachian League last year, but several accounts have him pitching better than his 1-9 record. I spoke with Danny Jansen, who caught several of his starts at Bluefield last year, Jansen said that Tinoco had dominant stuff, and was hard to hit when he got going. The trouble is, of course, is that he didn't always have that sinker going last year - he pitched six complete innings four times for Bluefield last year, His ERA for those starts was a tiny 0.67, compared to 7.59 for his other 8 starts. He has youth (19), a great body, the fastball (velo and life) as a foundation for his prospect status. He can really sink the baseball. His combination of fastball velocity and heavy sink reminded some of former Blue Jay farmhand Henderson Alvarez, who has the 7th highest GB rate among MLB starters. His changeup is presently his best secondary offering and his curveball shows 12-6 tilt at its best, though it is inconsistent. Tinoco will need to improve his lower half in his delivery because he often collapses his front leg and falls off to the first base side, causing him to not get on top of his pitches. But he has the raw materials to emerge. Keep your eye on Tinoco. Alvarez was just a kid out there slinging it, and the natural movement was ridiculous. Tinoco is more of a pitcher. Tinoco also has a defined curve. Alvarez had a semblance of a slurve that he had no clue what to do with. To be fair to Longnecker, he may be thinking of a more current version of Alvarez, as I recall reports about him at that time spoke about his rawness, and the need to refine his command. Tinoco was making his third start for Lansing against a West Michigan lineup that included Tiger prospects Derek Hill and Joey Pankake. He breezed through the first two innings, needing only 11 pitches in both to retire the side in order. He threw first strikes to the first three batters he faced, and generated three groundball outs in that first inning. In the second, he struck out Pankake swinging, and sauntered through a second three up-three down frame. Tinoco needed only 13 pitches to get through the 3rd, working down in the zone with almost every fastball that he threw, showing that heavy sinking action. I had him throwing only 3 pitches up in the zone through those first three, and two of those were outside of the strike zone. He allowed a bunt single that 3rd Baseman Justin Atkinson had no chance on, and was called for a balk on his first pitch to Hill as he failed to stop at the end of his stretch. We began to see a bit more of his breaking ball in that 3rd inning. He had six ground ball outs and a pair of swinging strikeouts through 3. The West Michigan hitters began waiting on Tinoco more in the 4th. He did have great control of his slider, though, bending hitters' knees a bit at least twice. He also gave up his first hard contact of the game, a hard line drive up the middle. Tinoco needed 18 pitches to get through the inning. The 5th is where things fell apart for Tinoco. With his pitch count up a bit, and with the West Michigan hitters getting their second look at him, they began teeing off on Tinoco's offerings. He gave up a hard hit leadoff groundball on the first pitch that handcuffed 1st baseman Ryan McBroom and was generously scored a single, followed by a hard hit double down the 3rd base line on the next pitch. McBroom made a nice play on a groundball after that, holding the runners at 2nd and 3rd, but the next batter cracked another double down the 3rd base line to score the runners. A flyball out to Left put Tinoco one out away from getting out of the inning, but he gave up more hard contact for another double (the fourth of the inning) to bring in the inning's' fourth run. Tinoco got a swinging strikeout to end the inning. He threw only 14 pitches in the frame - he lost the bottom part of the zone, which he had all but owned through the first four innings, and the West Michigan hitters hit his high-in-the-strike-zone pitches early in the count, and hard. Did Tinoco get rattled by McBroom's inability to cleanly field that first-pitch shot? That's hard to say, but he did seem to lose his focus that inning. He seemed to be trying to blow the ball by the West Michigan hitters, and he left the ball up as a result. There have been reports that Tinoco sometimes collapses his front leg during his delivery, which causes him to fall off to the first base side, and leave his pitches up. I couldn't tell if such was the case in the 5th - he was falling off toward 1st, but it was hard to tell from the angle we had if he was collapsing that leg or not. Now that he's in full season ball, there was no rescue from the bullpen for Tinoco in the 5th. He was given the chance to pitch out of trouble, and was also allowed to come back out for the 6th, which, after giving up another first pitch, leadoff double to Pankake, he retired the next three hitters in order, needing only 7 pitches to finish the inning. There was a lot to like from this outing. Take away that disastrous fifth, and you have a dominant performance. 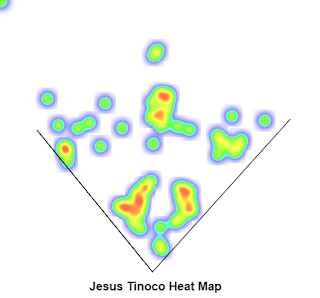 Tinoco retired 6 of the first 8 hitters on groundballs, and had 8 groundouts (against 3 flyball outs) on the day. He threw 74 pitches, 50 of them for strikes. For the day, Tinoco went 6 innings, allowing 8 hits, 4 runs (all earned), no walks, and struck out 6. 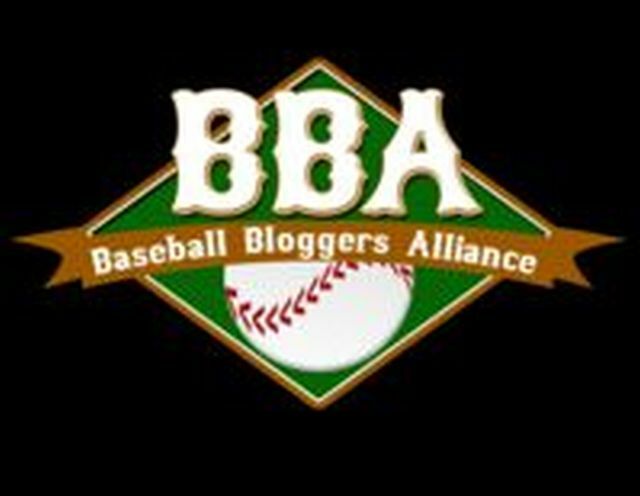 That the Blue Jays skipped Tinoco from Bluefield to Lansing (bypassing Vancouver) says a lot about the organization's belief in his abilities. Just turned 20, Tinoco is still learning, and making the transition from thrower to pitcher. It will be interesting to watch his development.